Aircraft propeller system market is highly competitive in current scenario. Propellers are kind of fan, converting rotational motion into thrust to transmit power. Earlier blades of propeller were wooden based but they are now made up of aluminum or composite. Propellers are best suitable in subsonic airspeeds up to 450 miles per hour, but going beyond this speed, blades tip reaches the supersonic speed, and the shockwaves disturb the engine efficiency. The demand of these propellers has grown in past years and is expected to grow in the coming years for its various advantages over jetliners. Goldstein Research analyst forecast the aircraft propeller system market size is set to reach USD 340.4 million by 2024, at a CAGR of 3.95% over the forecast years. The report covers the present ground scenario and the future growth prospects of the aircraft propeller system market for 2016-2024 along with the statistics of the type of aircrafts. We calculated the market size and revenue share on the basis of revenue generated from major players and sales of aircraft propeller system from major players across the globe. On the basis of aircraft type, military aircraft holds the largest market share i.e. 52.9% of global aircraft propeller system market owing to the high resistance against wear and tear and they are capable to meet the specific performance requirements. Whereas, on the basis of components, blades are leading the market due to its high requirement because of their innovative designing processes provides more efficiency to the aircraft. Aircraft propeller system Market Outlook 2016-2024, has been prepared based on an in-depth market analysis from industry experts. The report covers the competitive landscape and current position of major players in the aircraft propeller system market. The report also includes porter’s five force model, SWOT analysis, company profiling, business strategies of market players and their business models. Global aircraft propeller system market report also recognizes value chain analysis to understand the cost differentiation to provide competitive advantage to the existing and new entry players. According to the report, major driving factor for expansion of global aircraft propeller system market is the gradually increasing demand of turboprop planes, as they are more cost efficient than the jetliners. In the era of increasing costs, the airlines have been looking for cost reducing parts which has led to increasing demand of turboprops that uses propellers for generating power. Further, the major challenge this industry is facing are the technical disruptions and engine failures. Technical failures with the turboprops engine are the major issue. Many accidents have been reported due to propeller failure and crash of the airline. Based on geography, North America dominates the aircraft propeller system market with almost 42.4% market share in 2016, due to increasing demand of light weight, fuel efficient and cost effective aircraft. The market growing with highest CAGR is the Asia-Pacific with high demand for civil and commercial aircraft having turboprop engine and also military aircraft for developing defense sector. Our global aircraft propeller system market report comprises of the following companies as the key players in the aircraft propeller system market: Hartzell Propeller, MT-Propeller Entwicklung, Dowty Propellers, McCauley Propeller Systems, Airmaster Propellers, FP Propeller S.r.l., Ratier-Figeac. Other high-flying vendors in the aircraft propeller system market are: Aerosila, United Technology Corporation (UTC), Avia Propeller, Hoffmann Propeller. What is the total market size of aircraft propeller system market by 2024 and what would be the expected growth rate of the market? 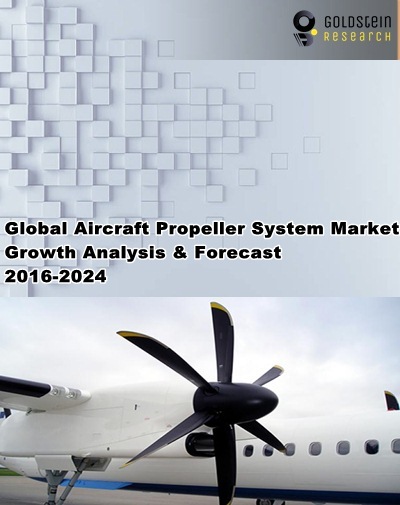 What is the revenue of aircraft propeller system market in 2015-16 and what would be the expected demand over the forecasted period?